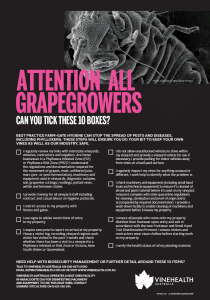 We continue to produce a range of posters to help you undertake best-practice farm-gate hygiene. We encourage you to download, print and display these posters in prominent areas around your office, lunchroom or shed. Why not give a printed copy to all staff? 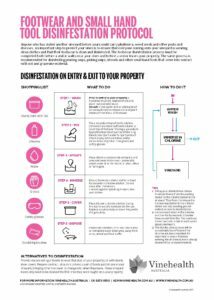 Are you biosecurity-ready? Can you answer ‘yes’ to these 10 farm-gate hygiene practices? This protocol is based on the latest peer-reviewed science. We now know that immersing footwear in sodium hypochlorite for 60 seconds (not 30) without a water rinse afterwards is a MUST for effective disinfestation against all strains of grape phylloxera. 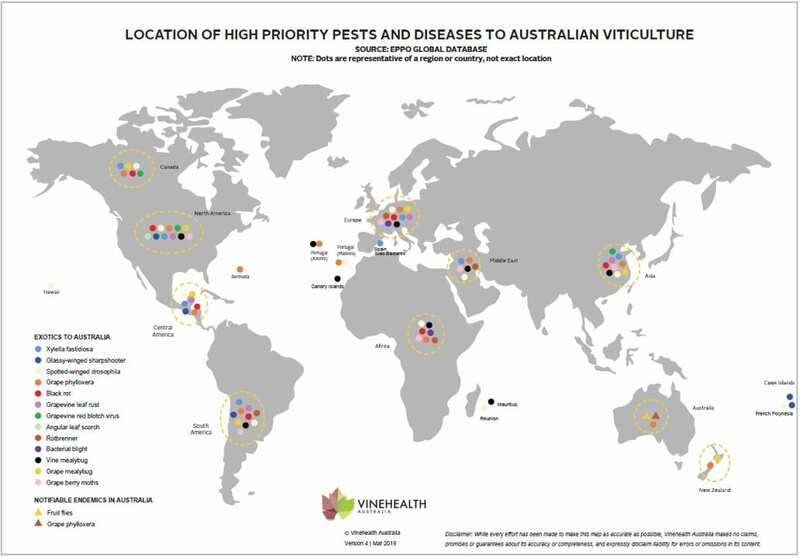 Do you know what high priority endemic and exotic plant pests and diseases could have a devastating effect in grapevines that you should be looking out for in the vineyard? 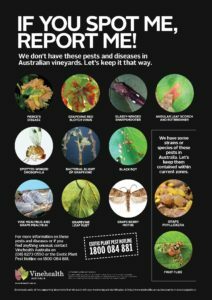 Use the “If You Spot Me, Report Me!” poster and supporting information to know what symptoms to recognise and when, and as always, report anything unusual immediately to the Exotic Plant Pest Hotline on 1800 084 881 or to Vinehealth Australia on (08) 8273 0550. Descriptive table of technical information on characteristic vine symptoms, impacts on vine growth and fruit quality and when to monitor.